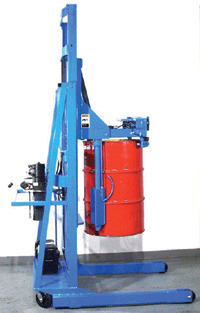 This new MORSE drum handler can lift a horizontal 55 gallon steel or plastic drum with suitable rims, or an upright drum from floor and tilt it to horizontal, and set it into a drum rack. Denset racking is possible because drums need not be separated. 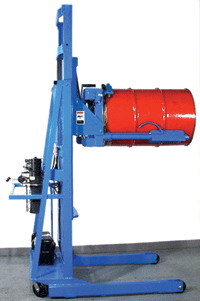 Lifting arms fit easily into the spaces below the curvature of the drum. MORstak replaces expensive lift trucks. 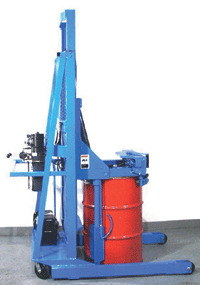 It eliminates hazardous bare fork handling of horizontal drums, upends and down-ends drums, and moves in tighter spaces. 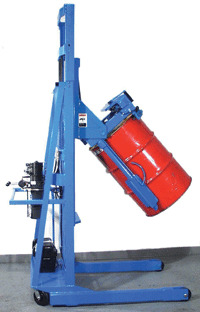 Two easy-to-use valve handles control the power lift and tilt functions. A visual indicator informs the operator of the recommended height for tipping drums. 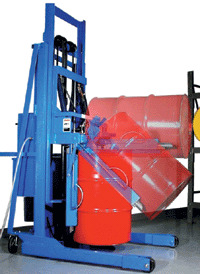 A drum presence detector prevents tilting from horizontal until operator secures drum in place. Power Options: Air, AC or 12V DC. MORStak TM Drum Rackers handle ONLY a 55-gallon drum with top rim, and maximum weigh of 800 Lb. They will NOT handle a smaller drum. When the Drum Pad Kit is installed (Included), it reduces maximum drum cradle width you can place a 55-gallon drum onto from 19" to 13"